I can hardly put into words how excited I am to make this post. This book has been such a long time coming. It has seen two release dates come and go. It has been delayed because of mental health and school and work and life. I have been hanging onto it, tweaking it, adding to it, editing it, rearranging it. Part of what makes me so apprehensive about releasing this book has been the content. All of my books are pieces of me - Ready Aim Fire is about my struggle with major depressive disorder, Basket Case delves into my experience with generalized anxiety disorder, and Exit Ghost deals with the loss of a family member and allowed me to verbalize my grief for my brother and grandfather. But Fictitious is different. Fictitious is about the one constant I have always had in my life: fiction. It's about the books I read as a child, the movies that inspired me, the plays and musicals and video games that opened my eyes to worlds real and imagined. It's about the characters that inspired me, the narratives that challenged me, the stories that shaped and changed and taught me. 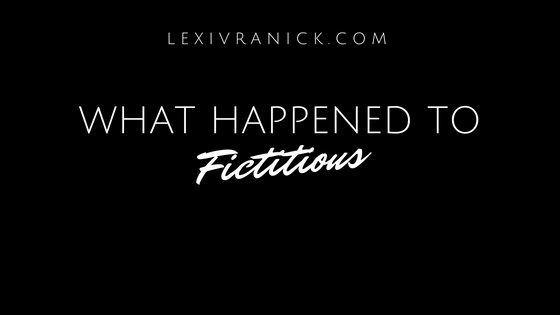 Where my other books are all about things that have happened to me, Fictitious is about the thing that I chose, and continue to choose over and over again. This book is my soul. This book is all the pieces of me I've held close. The pieces I've been afraid to show other, but that are integral parts of me. When I started to struggle with my mental health while working on this book, I think I panicked. I started to hold all of these things - these paper people and pixelated worlds -a little bit harder. I wasn't in a place to share it yet, as excited as I was when I started. I'm back in a place where I'm ready to share this. As I said during the Power of Fiction blog series, I know that I'm not the only one who has found solace in make-believe. I'm not the only one who has curled into the pages of a book when the world gets too loud, too scary, too heartbreaking, too hard. I didn't realize this for a long time. For so many years, I thought I was odd for being this passionate about pretend stories and people and places. But why? Why would I feel that way when these stories are made from someone who needed an escape themselves, or who needed to find a new way to look at the world around them? Why would I feel that way when the intention of so many artists is to connect with people? To transcend their mediums and reach audiences they've never met. As a writer, I know how important it is that my work influence not only me but other people. I know that it's not strange to find comfort in words and images. And so this book essentially says: Fiction is important, is powerful, is meaningful. Fiction is a part of my life, and it's a part of me, and it can be a part of you, too. I'm ready to make that statement. I'm ready to share this book that bares my heart so openly. And I'm going to do it on August 27, 2018. Fictitious was set for April 24th. And then it was pushed to May 15th. And now it's up in the air. This is not to say that I'm giving up on my second poetry collection and fourth self-published title. On the contrary, this is to say that I'm still plugging away at it. Still adding. Still editing. Still working. In an Instagram Live video last night, I discussed a little bit about what was going on: the renovations to my house, the preparations for law school, the mental health struggles I've touched on before. All of this has culminated in a great big, overwhelming mass. And here I am, with a book still unfinished and two publishing dates passed. I don't want to dwell on this. I want to work through it. So, that's what I'm doing. This book, it's subject matter and what it stands for, is important to me. In a lot of ways, this book is me - a piece of me, at the very least. It deserves to be showcased in its best possible format, and getting to that best possible place is taking time. It's taking more time that I anticipated, especially with all else that's going on. I don't say this as an excuse. I say it as an explanation. I want you to be able to read this book and feel everything that it has made me feel. I want you to connect with it, and with me. I want to let it breathe. I want to let it shine. I'm not going to give a new release date, partly because I'm afraid to miss another and partly because I don't want to add additional stress to my shoulders. This book will be finished. This book will be published. This book will be in your hands. And all of this will happen soon. In the meantime, I will continue to shout-out the amazing guest bloggers who have participated in the Power of Fiction series in conjunction with Fictitious's intended release. These people and their stories are the heart of the reason why I wanted to write this book. The way that we connect with fictitious places and people is so incredibly powerful, and so incredibly important. This is the conversation I wanted to start, and the conversation I want to continue having with all of you. I will also continue to post previews along the way. I will still be sending out advanced digital copies to those I've promised, though at this point I can't guarantee when they'll be sent. Once they were, I will set a proper release date, and host proper release events, and have a proper release celebration. For now, I just want to thank you. Thank you for sticking with me. Thank you for not giving up on me. Thank you for supporting me. Thank you, thank you, thank you - from the bottom of my heart - for being here with me.